Four Seasons at Palm Springs is a gated 55+ active retirement community in Palm Springs, California. It offers gorgeous views, top-notch amenities and a vibrant lifestyle with a desirable Palm Springs address. Four Seasons at Palm Springs is ideally located only five miles north of downtown Palm Springs. This admirable address is situated within reach to the allures of the desert and the surrounding Coachella Valley. It is just minutes from I-10, which provides quick access to all of southern California's favorite destinations such as Los Angeles, San Diego and Orange County. The popular Four Seasons active adult communities by K. Hovnanian are very popular with the 55+ crowd. 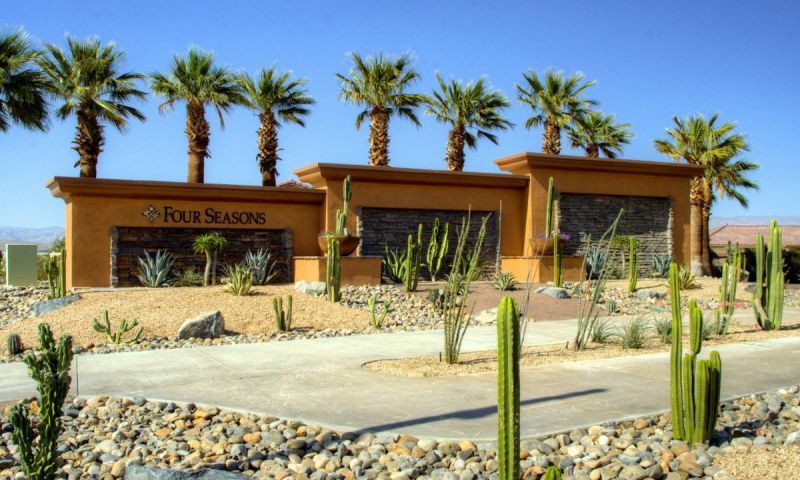 Four Seasons at Palm Springs is a mid-sized community that caters to retirees who want the available amenities of a large-scale resort but in a smaller, more close-knit neighborhood. The Lodge is a beautiful clubhouse in the center of Four Seasons at Palm Springs. It boasts a fitness center for staying in shape. There is also a salon and cafe for enjoying a leisurely afternoon. Residents can also discover a new favorite book in the library or gather with neighbors around the billiards table or by playing a quick game of table tennis. Four Seasons at Palm Springs also has a conference room. Outside, a six-acre amenity complex features two pools and a spa for enjoying the beautiful year-round weather. There are also several ways to stay active with tennis, pickleball, bocce ball, basketball and shuffleboard courts. Walking and biking trails weave throughout the community. Homebuyers in Four Seasons at Palm Springs can select from seven single-family, ranch-style floor plans that range from 1,900 to over 2,800 square feet. Four Seasons sold out of new construction homes in 2010 but there are a handful of pre-owned resale homes on the real estate market in the community. Many of the homes include finely appointed finishes such as maple cabinetry, granite countertops, GE appliances and more. Private courtyards and expansive great rooms ideal for entertaining are a staple of every home in Four Seasons at Palm Springs. An exciting lineup of social, leisure and fitness activities await the residents of Four Seasons at Palm Springs everyday. There are a variety of clubs and interest groups that include everything from yoga, line dancing and golf to arts, crafts and cards. Other popular activities include Friday night socials, bowling league, morning coffee and poker. Regardless of your interests, you will surely find other residents in Four Seasons at Palm Springs who share similar passions. This beautiful 55+ community provides a tranquil yet active atmosphere where residents get to know one another. For residents whose life is defined by the world outside of their home, the area around Four Seasons at Palm Springs is a recreational and cultural paradise. The Palm Springs area is renowned for great shopping, world-class resorts, top-notch medical facilities and fine dining establishments. The surrounding mountains are filled with deep valleys and scenic ridges ideal for hiking, mountain biking, camping, horseback riding and Jeep tours. Nearby, Joshua Tree National Park and the San Bernardino National Forest are great destinations for outdoor adventure lovers. Plus, the area is home to some of the most famous golf courses in the world. Over 200 golf courses blanket The Coachella Valley and the surrounding area. It is easy to see why people love this active adult community with a desirable climate, stunning homes and an abundance of recreational options in and around Four Seasons at Palm Springs in Southern California. There are plenty of activities available in Four Seasons at Palm Springs. Here is a sample of some of the clubs, activities and classes offered here. Want the perfect balance of space and affordability? Look no further than the Palm Collection homes. With three choices around 2,000 square feet, the Palm Collection Homes feature open layouts and expansive great rooms making them a favorite among many active adults. Most homes feature two to three bedrooms, two bathrooms and a two-car garage. The Canyon Collection homes are designed for the those who seek the finest upgrades and ample space. These homes are ideal for entertaining and offer plenty of room for out of town guests. Homes range from 2,288 to 2,635 square feet and features two to four bedrooms, two to three-and-a-half bathrooms and a two-car garage. We are writing in reference to the realty services we have been lucky enough to receive from Diane McMillan. We are Canadians looking to buy our dream vacation home in Palm Springs. We had the pleasure to work with Diane who was kind, patient ,hard working and knowledgeable. I would recomed her to anybody looking to buy or sale. When Diane showed us out new home here at Four Seasons....it was love at first sight! It was the first and only house we looked at. It was very reasonably priced. We were living in a condo also in Palm Springs and now have twice the space which includes a den plus a double car garage. We are beautifully located on a large corner lot. Our HOA dues are over $100 less so that helped tool Because of the reasonable price and the lesser amount down that we needed we had plenty of extra money to totally landscape both front and back yard with desert style and artificial grass which has continued to stay green! LOL We did paint inside and carpet some areas but that is normal. We have not had any major repairs. We were living in a very central part of Palm Springs and we are no more than 2 miles (and in some cases closer) to our favorite places. Our home is certainly worth that distance. We do suffer from the winds certain times of the year--April to June being the worst, but over all we have a wonderful climate.Even most of the summer is tolerable and many residents stay here year round, ourselves included. We have a home built in 2005 and we have had no problems with it--except a dishwasher we had to replace. The community is very friendly to all and there are many activities to choose from. The Bistro offers good food at very reasonable prices and the other ameneties at the lodge are well maintained and of high quality. The walking trails on the east side are a great way to get out with a pet and get some exercise. Everything is within 10-15 minutes away. I would recommend Four Seasons to others as an affordable gated community for those over fifty-five. Granted there are communities with less wind, but at the sacrifice of location and price. KHOV never told us about the horrendous winds here. As I write this, we've had over two months straight of winds. We cannot use the pool because of the winds and we almost get blown over when walking from the car to the house. The winds nearly took my car door off and some of my windows are etched from the blowing sands. The homes are built with many problems including foundation cracks. The windows are inferior in quality and let in sand to the homes. There are cracks in the stucco exterior and they used knotted and split wood on the front porch. The awnings are placed on the north side of the house but missing on the south. I could go on. The models were beautifully done and the floor plans were all excellent but the actual homes are just tract builders and add that to inferior plumbing, electricity, AC and duct issues (we have uneven cooling and heating throughout the house). Not only that but the AC units are placed right outside the bedrooms! WHY? We've had a disastrous roof leak which ruined irreplaceable old family photos: cracked floor tiles (due to foundation cracks); non-functioning windows, cheap faucets had to be replaced and a cracked concrete front porch. I am sorry we moved here, despite the nice clubhouse and pools. We paid top dollar and probably now that the truth is out, we couldn't get half of that (market dips aside). 55places.com is not affiliated with the developer(s) or homeowners association of Four Seasons at Palm Springs. The information you submit is distributed to a 55places.com Partner Agent, who is a licensed real estate agent. The information regarding Four Seasons at Palm Springs has not been verified or approved by the developer or homeowners association. Please verify all information prior to purchasing. 55places.com is not responsible for any errors regarding the information displayed on this website.